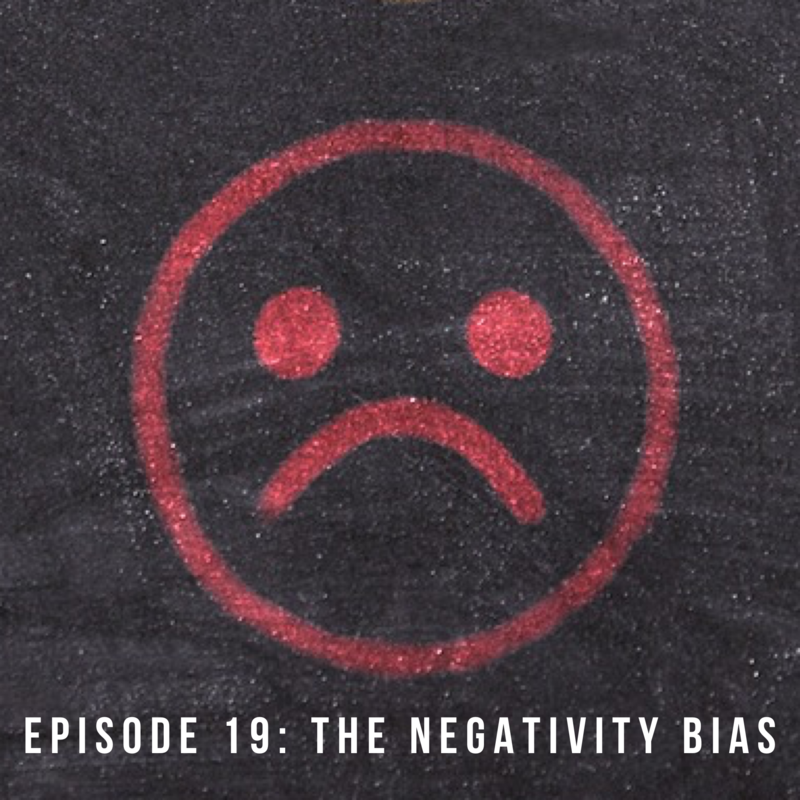 After last week’s episode on, when someone doesn’t like you I thought it’d be a good Segway into talking about negative experiences and why they tend to stick around so long, sometimes for decades or longer. Why is it that everything could be going right and you’re feeling good and then one person makes a negative comment towards you and your world falls apart? Why is it that one small event can ruin an entire day, week, or a trip? I think this is a really appropriate topic right now as we’re venturing into the holiday season and with that lots of opportunities to think about our families. You might have plans to get together with them for Thanksgiving and Christmas coming up or maybe you’re not getting together. But there’s a lot of inner drama and pain around the holiday’s because of our thoughts about family and what we wish they’d be doing or not doing. Maybe you recall a particularly heated or uncomfortable get together and now when you think about the holiday’s you’re a little stand-offish and lots of thoughts fill your minds. When I was a kid we’d have huge family gatherings. All my cousins and aunts and uncles would get together. It was just this big ordeal and so fun and chaotic. Then as the years went by and circumstances arose and wedges were built things aren’t the same as they once were. I love the holidays but when I think about them I do think about certain times when it was uncomfortable and the people that don’t come anymore. It’s really bittersweet and I know that it’s this way for a lot of people so I wanted to bring this topic to you today in preparation for the holidays and give you awareness and something to help you to change this bittersweet to hopefully a little more sweeter. Think about this, you could have mostly all wonderful get togethers, years of fun and love and then one event, one comment, one heated debate over who knows what and that’s what you think about. One year we had this huge debate about gifts and it was ridiculous and very uncomfortable and each year when I think about the holidays and gifts there’s this part of me that remembers that and it brings back those thoughts again. Even though it was years and years ago, even though there’s been years of great, no drama gift giving and fun, my mind still wants to remember that one evening. Why? Why do our minds do this? We’re prone to believing the negative over the positives. The negatives stand out much more than the positives ones. Psychologists call this, the negativity bias. Which basically means that we’re much more sensitive towards negative events over positive events. It remembers them because it could mean danger. Something is wrong and so it goes on hyper alert that danger could be imminent. I spoke with a woman several months ago that was recalling this particularly painful experience that has stayed with her for years and years. She was given a presentation and in the middle of it someone raised their hands and made an abrupt comment that they didn’t agree. There wasn’t an argument or a heated debate that broke out. Just that comment but it was enough in her mind that registered it as danger even though many others commented after her presentation that it was wonderful and how much they loved it, that one comment stood out and got stored in her memory for years and years and each time she thinks about it, it brings back pain, anxiety, and negative emotions. Have you ever done this? I so have. Just one negative comment out of fifty positive ones and the one we tend to dwell on was that one. We think about it because we perceive it as a danger, as a threat, and as a hint that something just might be fundamentally wrong with us. No wonder it stays as long as it does. Our brains are perfect and working as they should to detect possible dangers and solve problems for us and it’s really good at it’s job but it’s difficult to live our lives like this. It difficult to experience a happy, joyful life when we’re always on the lookout for negative situations and circumstances. It can also taint and cloud over many positive memories and experiences if we only remember and focus on that one tiny thing. Think about it this way, back in cavemen days this negativity bias was necessary. It was a survival tactic that served them very well. They were constantly needing to be on the look out for possible threats and dangers. They never knew when a Sabertooth tiger would be prowling around the corner or when they’d need to react at a moments notice. Their brains were constantly on high alert to keep them safe, to keep them alive. When they encountered something negative it was really helpful for their brain to store that away so it could be on the lookout for that same or similar thing the next time. The primitive’s brain’s job was and is to keep us alive, look for danger, sniff out any possible threat. Our evolved brain still operates from this primitive wiring. It’s still on high alert to look for danger. That’s why our amygdala expends two-thirds of it’s neurons looking for potential negatives. It doesn’t register that there aren’t tigers about to pounce at any given moment. It doesn’t register that there isn’t a problem so it’s constantly looking for problems to solve, looking for negatives to latch onto and protect you from. And while this once served it’s purpose and had benefits to operating from this stance, in today’s evolved world, not so much. It can do much greater damage than the potential for good. When someone makes a harsh comment about us or even to us our primitive brain is going to spin out and alert all the danger signals. This is a possible threat, this could be bad, we need to react. Then we think and stew about that one comment over and over and over again and each time our brain is looking for more and more evidence that it was indeed a terrible experience. It pulls up looks that people gave us, examples of them walking away, or sighing ever too loudly. We bring all that in and it makes that one little comment into a huge dangerous, painful experience that could stay with you for years. We’re hardwired to find and focus on the negatives. When we focus on the negatives what happens to our bodies? When our thoughts are centered on negativity and problems we’re going to generate a feeling – is it the kind of feeling you want to be feeling? Is it the kind of feeling that is going to motivate you into the kind of action you want to be taking? And then, are those actions going to create the results you want in your life? In other, shorter words, What’s the upside to thinking that thought? Will keeping that thought serve you and help you show up as your best self? If I really were in a dangerous place then yes, for sure, I need to be on the look out for possible threats and how I can get myself to safety. But if it’s at church and someone doesn’t agree with us, what’s the upside to ruminating on that comment or comments? Is there really a threat there? Probably not. So here’s where all your power comes into play. Here’s where you can create your experience and change your perception. First, we know that our brains are like plastic. They can be re-wired to create new connections and adapt to challenges instead of being fixed in a negative state. We can learn new things, we can strengthen positive thoughts and create helpful habits to train our brain to look for the good. We can learn to focus on things that will help us like, looking for abundance, being grateful, bolstering resilience and strength to our challenges, and seeing things as they really are: a challenge – something to help us grow instead of a problem and a dead end. In order to do this we have to be willing to spend some time practicing the thoughts and habits we want to create and operate from. Scientists and researchers tell us that we need to focus on positive experiences for a minimum of 12 seconds in order for it to stick and be transferred and stored into our long-term storage. I have to tell you this experience I had. We were in the process of finalizing the selling of our home and purchasing a new one. We thought everything was just about done and finished. We were scheduled to move in in a week and a half so things were just about done. My husband had some business in southern CA and it happened to fall at the same time as our anniversary. We figured with everything going on that we’d make the most of it all and go to Disneyland on his days off and I have no problem keeping myself busy and occupied on the days he had to work so off we went. We had tons of fun both on Disney days and working days. And on our anniversary we made special reservations to eat at a nice restaurant in Disneyland and just have a blast. While we were there though we got a call from the title company needing a ton of documents. They needed items from the bank and forms we had already filled out and just loads of stuff that we didn’t have nor did we have direct access to them as we were in Disneyland. My brain instantly processed this as: danger, threat, we could lose the house, we’ll be homeless, the world is ending – you know, the normal like all first reactions tend to go. Then we stopped and had to think and be creative. So we made a zillion phone calls and tried looking up the nearest business center so we could use a computer, fax machine, everything we’d need to get them what they wanted. The Disney employees pointed us to their business center in their nearest hotel and we got started doing everything we could to get the info. It was kind of a mess. The bank wanted us to come in, which was out of the question. The title company wanted all the hundreds of pages front and back faxed over to them – which was about $2.00 a page to fax. The fax machine wasn’t even operational. After trying several things we were able to get everything sent over, faxed – for free, and back on our way to our reservations and a wonderful trip. We were so grateful for the Disney employees that went out of their way to direct us to help, to taking their time to help us get what we needed and we weren’t even staying at that hotel. We weren’t even guests there. I told my husband to remind me to make sure that we go out of our way to thank them for all they did. It prompted a conversation between us that people are more likely to leave a bad review than leave a good one. Why is that? We came to the conclusion that when it’s negative it stings more – it’s unresolved and unsettled so people go to great lengths to leave bad reviews, to call and “vent” or complain, to tell all their friends and family to stay away from that company. But when it’s good, we’re all content. It’s resolved and you can move forward – and while we think good things about them and the situation, we tell our friends and family but people don’t tend to go out of their way or expend as much energy to thank or show their gratitude. Because we stayed present and talked about all the positives of the situation instead of all the setbacks and perceived negatives that memory is stored in my long term box. I remember the set backs but not with a fuming attitude, just part of the experience. Think about this for a moment: How much more likely are you to leave a review, or tell friends about the experience, maybe to go out of your way to thank someone for a good talk, a good lesson, inspiring you, or helping you out in some way rather than if you had been wronged in someway? When we’re wronged or perceive something as negative and wrong how quick are you to call a friend or someone to tell them about it? Can you believe?! How much more likely are you to leave a bad review? It’s really fascinating to think about – keep this in mind as you go through your week. Look at where your mind goes and how much energy you’re willing to expend to try to seek justice or restitution. My kids do this sometimes. When they’ve been wronged – this last week even one of the kids damaged a calendar of another sibling. So instead of talking to them they had to go around our property hunting me down so I could talk to the perpetrator and “make things right” – we hear a lot of complaining and tatting so to speak – adults still tattle too. But what about the other zillion positive times? How likely are they to expend that much energy to come find me to tell me the good things their siblings just did for them? Not as often. Same with us. When someone does something nice for us we might have nice thoughts about them but how much energy do we expend in sharing it with them or others? How much time do we actually spend thinking and internalizing it? My grandmother is pretty awesome. I just love her. My kids and I mail her letters and cards pretty regularly and each time she’ll call me to thank me. She admits that letter writing is not her thing but just how appreciative she is to get them. I love that she expends energy thinking of us and tracking us down – sometimes calling more than once to thank us personally. Think about the long term effects that act is having on her life? When she thinks generous, grateful thoughts about us, she’s generating feelings of gratitude, love, and connectedness. These feelings motivate her to go and do – to call, to share, to appreciate and comment. Those actions of calling and reaching out leads to the results in her life of strengthening bonds of love and connection with her family. This pattern – noticing how the model works in your life, that your circumstances can trigger thoughts within you but ultimately you get to decide what you’re going to think about things. If things are a problem or not. If things need to be escalated or de-escalated. Those thoughts create feelings which motivate you into action or inaction – and it’s those actions that create your results. Think about how different our anniversary trip would have been if we had stewed about the paperwork. We could have thought, we’re in Disneyland, there’s nothing we can do. Then we’d feel stuck. We’d probably whine about it and complain thus creating the result of not getting anything done. It would have been so different. We would have completely closed ourselves off from opportunity. We would have been blind to seeing it. So notice your thoughts. That is key – that is the pivot point. Which way, which path, which road are you going to take? Simply put, the more effort and energy you expend into noticing, valuing, and appreciating all the good, positive, and abundant experiences and aspects of your life, you won’t be prone to dwelling in the negative. You’ll in time rewire your brain to overcome the negativity bias. You’ll teach your brain to be on the lookout for all the good. Years ago we read the book, Pollyanna. I LOVE that book. It’s ten times better than the movie- in fact, after we read the book we were so disappointed in the movie because she’s not as positive as she is in the book. But Pollyanna liked to play what she called, “the glad game”. In her own attempts at creating a positive life for herself despite the negative situations and circumstances that arise she was determined to be joyful, optimistic, and glad. There’s a lot of value in playing her game. This isn’t to say that we don’t ever think negatively or notice negativity. It just means that when those moments arise, and they will, and they do, to decide what you’re going to do with them. How are you going to talk to yourself about the circumstance? Are you going to whine and stew in the injustice? Or can you talk to yourself and find the good? Can you linger in the good for 12 seconds or more? When you go to thank someone can you make it longer than a simple, Thank you? Can you talk to them and go into detail about why you liked it? If you read an amazing book can you reach out to the author or their publicist and share with them what you loved about it and the impact it made on you? When trials and challenges come your way can you see it for what it is, a challenge meant to help you grow instead of a problem that is wrong and unfair and it should be fair? Can you do likewise? Oh, good! I love a challenge! Remember, things are only problems IF we label it as a problem. If we tell ourselves this is a problem, it becomes one. If I tell myself that my kids didn’t clean their rooms again and the house is a mess and it shouldn’t be this way then I’ve created a problem. If I instead tell myself, oh good! I love a challenge, then I’m open to endless possibilities to teach them and come up with a solution to getting the results we all want. You can rewire your brain to think positively. You can train it to overcome the negativity bias. Start with staying present in the good moments. Find the good and stay there. You can even do this with past experiences. Think of a memory and find the good. Then stay there. Think about all the little details and why it’s good. Feel the feelings those thoughts call up. Add as much detail as you can – where did this memory take place? If you’re present – involve your senses into it- what does the air smell like? What are you wearing? Is it cold out? Think in as much detail as you can. Then take it a level deeper – put a thought into the model and see the results you’re creating – so much of the time we only use the model for negative things and trying to get out of them – but do it with positive thoughts so you can recreate them when you want to. What’s the upside to thinking that thought? What feelings does it generate? What do you do when you feel that way? What results do you create? Do this in your own life. Put a thought into your model. Now stay with it- notice how that thought makes you feel. When you’re feeling that way, what do you do? What’s your action? If can be something simple like, smiling even – it’s still an action. Then what results do you create? This is how you start retraining your brain – The next time your brain goes to the negative, don’t panic. It’s normal, it’s natural, it means your human. What you do next though is crucial. What do you want to think about it? What you decide to think about it will make all the difference in the results you create for yourself. Is there an upside to thinking that thought? Okay, start there and let me know how it goes for you! I’d love to connect with more of you. I really appreciate all of you that email me and connect. I value each of you and I love hearing your story! If you’re having a hard time applying this on your own, no worries. I’ve got you covered! Go to my website and set up a free call with me. It’s short and sweet and I’ll give you real tools to help you out and get you moving again. So go to www.thecatalystcoaching.com and under the tab free coaching set that up.